It's perfect for any cat that loves cardboard. Hey, cat owners! 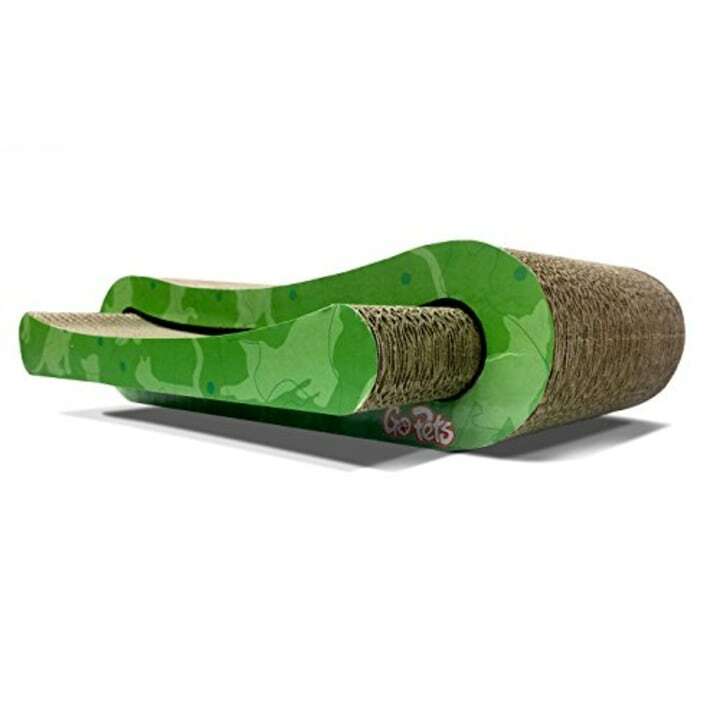 Some nice large, functional cardboard cat scratchers are 51 percent off on Amazon. I have a cat who love these things. So, I bought one this morning. It doubles as a storage solution for cat toys and a lounge. When I adopted Ollie, fear settled in. Would this new kitten destroy all my furniture? A cat had scratched up my friend's gorgeous leather dining room chairs, which I saw with my own eyes. So, looking at my adorable little fur ball conjured up images of the ruined (but formerly beautiful) seating arrangement. With dreams of a living space worthy of a West Elm catalog, I couldn't let that happen to me. The internet provided a solution: cardboard cat scratchers — one for the living area and one for my bedroom. Long story short, Ollie hasn't scratched my furniture and we've been happily coexisting ever since. Instead of my leather couch, upholstered chaise lounge or mattress, he scratches these cardboard things. Truth be told, I also bought a nice, expensive cat tower a few months after getting Ollie. But, he doesn't scratch it nearly as often as he does the cardboard scratchers. Considering I spent a lot of money on the tower, it enrages me a little. Alas, Ollie likes what he likes. You have to replace these things after they get worn down, so I ordered one from this Amazon deal today. It's a good price, the reviews are solid and I know my kitten will use it. Look, I love my cat. But, I don't trust my cat. So, I'll order these cardboard cat scratchers on a regular basis for the foreseeable future. They're small enough to fit in most living areas and easy on the wallet, so I'm in. If you have an untrustworthy cat (aka any cat) I'd suggest picking one up too. The price will show up at $19 when you open the page, but clip the coupon and it'll be $18. That's a price I'm willing to pay (and did pay) to keep my sanity and leather couch in tact. While we're at it, if your cat gets litter all over your house, I found a solution for that too. Behold: the perfect litter box.